Here is my problem : I'm using the activeX PDFXChange and I need to extract selected pages (in thumbnails panel) from an open document in PDFXChange to a file on disk. I realized that the "Selected Pages" option was disabled: the activeX did not seem to see that pages were selected yet there were several. All other settings were ok: DeleteAfterExtract enabled, Save As with filled paths, etc. After testing, the setting.dat does not seem to have an impact. What do you think blocks and makes sure that the selected pages are not detected initially ? For info, the multi tab of the viewer is disabled. 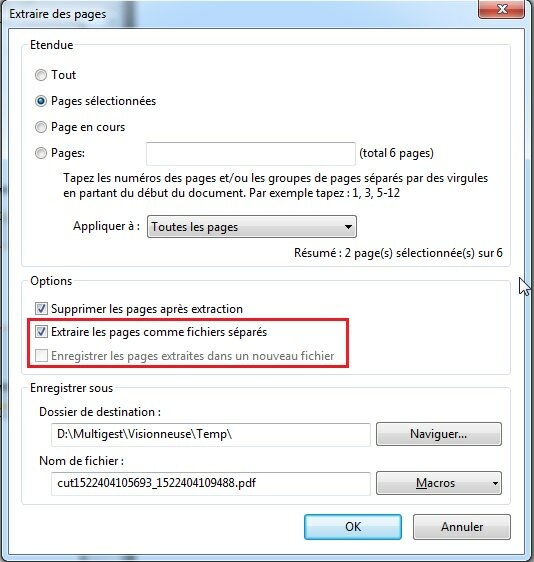 Another remark always using the code above: when the prompt is activated, we can see that it is the box "Extract pages in separate files" which is checked while it should be the box below "Save pages to a new file "? (ExtractToFiles and ToOneFile being 1). In the end, it has no impact on the behavior and it seems to be just a visual bug.